Make no bones about it: positive reviews increase sales. Not only does positive feedback influence buying behavior, it also plays a key role in Amazon’s customer-centric strategy, as seller ratings greatly impact your chances of winning the Buy Box. That’s where 82 percent of all sales on Amazon happen, which means that feedback and sales performance go hand in hand. Knowing why feedback matters is only the first step on your path to winning the Buy Box. Next you need to get your seller page filled with a whole bunch of 5-star reviews. 1. Personalize the request and subject line with the buyer’s name, product and channel to create a relationship. 2. Ask if everything with the order process, delivery and product is satisfactory. 3. You can’t directly ask for positive feedback, but you can use language that encourages a positive review. 4. Make it easy for the customer to leave feedback by including a link. 5. Avoid negative feedback by inviting the customer to resolve any issues directly with you. Send a request when the buyer is most likely to respond. Consider time zones, national holidays or other instances when they may not be available. Ensure that you schedule your request when the buyer has had a chance to use the product. Only request feedback from customers that you’re confident received the best possible experience. Factors to consider are on-time delivery and seamless support. If your customer has raised a support query with your company, choose to exclude them from receiving a request for feedback. Products that might break on delivery are the ones to avoid when aiming for a high feedback score. Instead, choose items that travel well and have a good review history. Analyze the products that have historically scored well with your customers, so you can target positive feedback from happy customers. When requesting feedback, go one step further and provide your customer with any product resources that might entice them to throw an extra star your way, or include links to video tutorials, so they can get the most out of your product. Address any common queries relating to the product and ask your customer if they need any help getting started. If you receive negative feedback, the most important thing to do is apologize. Your response should be personalized, so that your customer feels their opinion is valued Address your customer in a positive, respectful tone, but try not to be too casual as this can upset an angry customer even further. How can eDesk help you get more Amazon reviews? You could send emails to every one of your customers, asking them to leave you a review, but that’s not only time consuming, you also have no guarantee that you’ll get the type of reviews you want. That’s why you should only ask for feedback on the right products, from the right customers, at the right time—eDesk helps you target positive feedback, and lots of it at that. 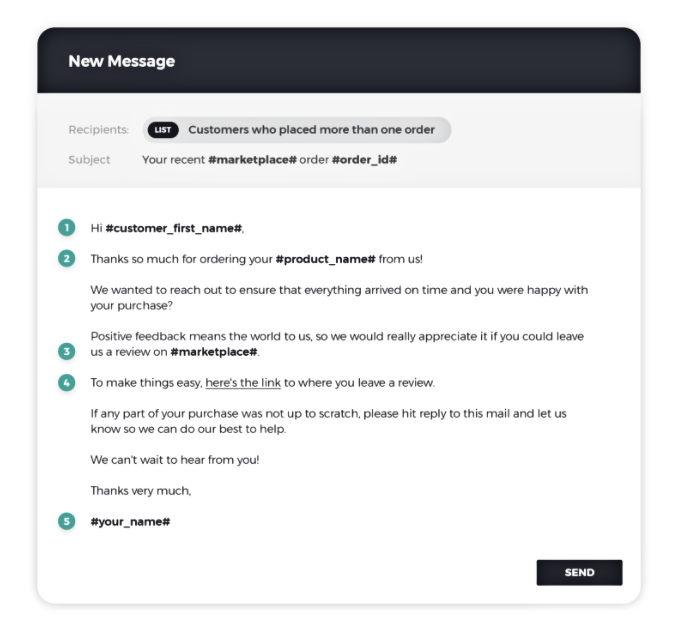 Our feedback software helps increase your seller rating by sending smart, selective requests that improve your brand reputation and grow your sales. You can tailor your feedback strategy to target orders by SKU, product type, on-time delivery, destination and more. Just because you’re sending an automated feedback request doesn’t mean it has to sound robotic. Our feedback software offers personalized tags that automatically insert information like the customer’s name and delivery address, what they ordered and other key details. Remember, the more positive reviews you have, the better your chances of winning the Buy Box. eDesk is the leading helpdesk for online sellers, purpose-built to address the precise demands of e-commerce. Sign up for a no-hassle, 14-day free trial right now and see for your yourself the difference it will make to your business.